KYIV, 18-Jul-2016 — /EPR FINANCIAL NEWS/ — For the 6 months of holding spot electronic trading on the electronic trading platform of the Ukrainian Energy Exchange Public company PJSC “Ukrgasvydobuvannya” has managed to significantly increase the level of competition on its resource by bringing a larger number of participants. The Exchange has a well-established system of using security deposit and the online queue. All this had a positive impact on results of trading of company’s products – The State Company sold oil products and liquefied gas with total amount of 88.6 million USD. This was reported by CEO of Ukrainian Energy Exchange Oleksandr Kovalenko, summing up the result of trading on the UUEX on Thursday, June 30, 2016. According to experts of the fuel and energy market, additional yield of PJSC “Ukrgasvydobuvannya” has made more than 6,8 million USD. “We plan to introduce futures on some petroleum products next year. This will make the market more active and attract more investors. The same vector we chose for other markets: coal and natural gas. The development of the exchange market is a reflection of the economy development of each country,” – said CEO CEO of Ukrainian Energy Exchange Oleksandr Kovalenko. “We are pleased with the use of Commodity Exchange Ukrainian Energy Exchange. This mechanism of trading has enabled us to generate additional profit that will be used for investment in production and will improve the overall energy independence of our country”, – said Commercial Director of UGV Serhii Fedorenko. “Of course, the appearance of the price indicator(https://www.ueex.com.ua/eng/exchange_quotations/) of petroleum products on the domestic market has a positive impact on the market. First, this indicative is for the end user, who now has guidelines for fuel purchases. Second, the publication of prices makes the work of the manufacturer transparent. If we are talking about “Ukrgasvydobuvannya” state-owned business transparency should be one of the main tasks”, – said the analyst consulting company UPECO Oleksandr Sirenko. According to expert, similar trading for imported fuels, which share reaches 80% should be brought for a more dynamic competition in the Ukrainian market of petroleum products. All contracts were executed in full and on time. None of the bidders have lost a security deposit. Experts of the exchange conducted huge number of training seminars and tutorials. Ukrainian Energy Exchange has designed and implemented functionality for distributing of exchange quotations, which is completely free and available without any restrictions. LIMASSOL, Cyprus, 06-Jul-2016 — /EPR FINANCIAL NEWS/ — Orbex, a leading global forex broker, is celebrating its 4th international award this year. 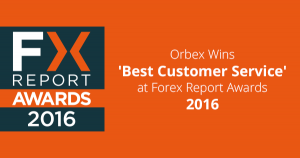 Orbex has been recognized as the ‘Best Customer Support’ provider by one of the most authoritative industry’s websites – Forex Report, which has selected the winners in each category according to the strict criteria and traders’ feedback. This prestigious award demonstrates the strength of Orbex customer-centric approach, as well as its leadership in responsible trading services. The focus on customer experience is a major guideline, aligning all the company’s activities and concentrating on protecting the best interests of the traders. Orbex continuously improves the quality of the customer care and invests in new technological solutions, meant to reduce the waiting time and expand the growing set of support capabilities. Following the high ethical standards allows building long-term and sustainable relations with the traders. “For us, the key element in supporting our clients is “Response Time,” as we understand how valuable time is for our traders. No matter which communication channel clients use, live chat, emails, call backs, social media, they get a response instantly. We align our interests with those of our clients by taking their needs to a personal level, and implement them,” commented Zaid Alkhatib, Head of Back Office & Support Department.